Sixty of the country’s most distinguished dealers present the finest offerings of American antiques and decorative arts, including furniture, paintings, rugs, ceramics, silver, jewelry, and more. In addition to exquisite antiques shopping, don't miss the keynote lecture as well as weekend lectures with young scholars. Join us for cocktails and exclusive early shopping at the Opening Night Party on Thursday, November 7, 5:00–9:00 pm at the Chase Center on the Riverfront. See the brochure for more information. For tickets, call 800.448.3883. The Delaware Antiques Show provides a wonderful learning environment for those who are new to collecting as well as for antiques experts. Look for "Find!" signs that highlight objects of special interest and value. The dealers are always open to answering questions and providing information. Here are some tips for new collectors from Delaware Antiques Show committee member, Forbes Maner, to help you get the most out of your visit to the show. 1. Collect what you enjoy. 4. Buy the best you can afford. For more information on the show, e-mail das@winterthur.org. 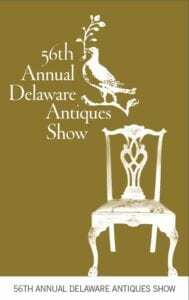 Read the stellar review from Antiques And The Arts Weekly on the 2014 Delaware Antiques Show!